The pound traded at its lowest levels versus the dollar since 1985, off 22% from its June high before the Brexit vote. The pound’s strength has become incredibly contingent on the outcome of Brexit, placing tremendous pressure on the currency at a critical time. There has been a steady descent in the pound since the vote. Markets are concerned that as Britain plans its exit, which is expected to happen in the next two years, it will dramatically hinder the financial and banking sectors. The reason is that exports of British products to the EU might be severely limited once the exit has taken effect. Britain’s current prime minister has expressed priority in limiting the influx of immigrants into England from the EU. This stance could very well become a significant issue with the EU, since not allowing immigrants from the EU the rights out to access Britain would surely threaten Britain’s ability to trade and travel freely throughout the EU. The most vulnerable sector to such retaliations are the financial and banking sector, which heavily rely on free movement of employees throughout the various country’s in the EU. 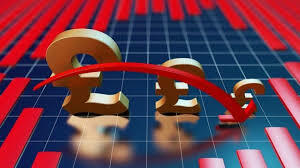 The financial and banking sector accounts for 12% of Britain’s GDP, a considerable portion of the economy. Since Britain’s economic future has become contingent on the outcome of Brexit, the IMF downgraded its growth forecast for the country, predicting that the British economy will only grow a paltry 1.1% in 2017.